I’m so excited to share this. It took me about a month to finish (I really took my time to be honest). I had the idea in my head for a while and decided to go for it. 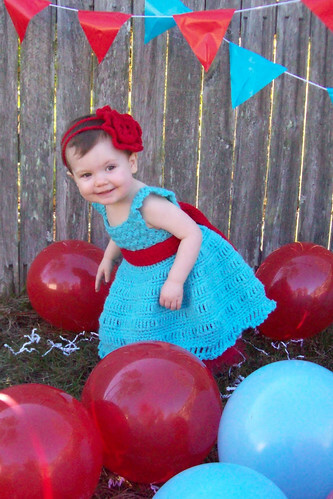 I free styled the dress completely and used this pattern to make the headband. I did modify the flower to achieve this look. 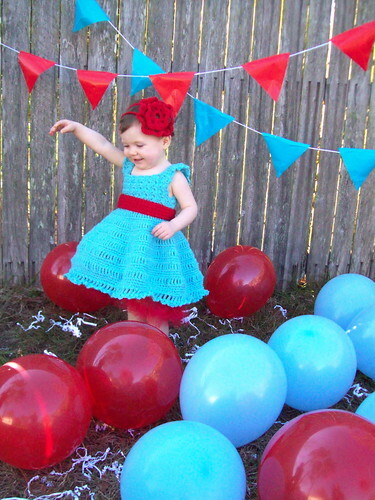 The yarn I used was Vanna’s Choice Baby in Aqua and Vanna’s Choice in Scarlet (all purchased at Michael’s). 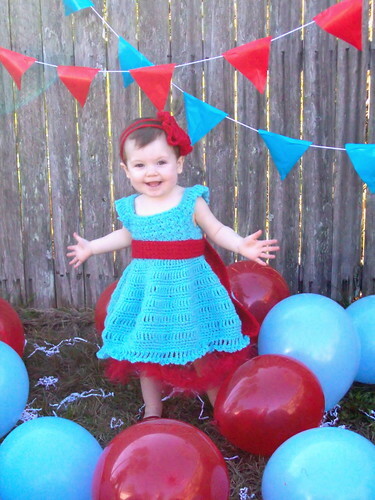 I used one skein of the red and a little over three of the aqua.I made a simple tulle skirt to go underneath. I absolutely adore this on my daughter! I have never crocheted a dress before, so I was so happy it came out this way. I have a bizillion more pictures on my flickr if you would like to see them. Oh my goodness, so sweet! Love the vivid colors, and what a great photo shoot! Was this a birthday? Glad to hear you are settling in, you ought to check out mommy and me websites, looking for local activities, so you can start having play dates. Keep up the great pics! I love this!!!! Jaala is beautiful!! Thanks 🙂 It actually was just a photo set up in our backyard that I did. I cut up flags from wrapping paper from the dollar store, taped them to string, threw paper shredding on the ground and blew up a bunch of balloons. She loved it! Thanks for letting me know about mommy and me. I found one group on meet up that I’m going to try out too. oh my! she looks absolutely adorable with that big flower on her delicate head. and the dress is gorgeous, specially with the tulle underskirt. What a beautiful dress, I love those colours together! okay so um can i just say “INCREDIBLE! !” can you make one for me? i can email you my measurements! oh did you think i wanted one for my daughter? yeah i would like that too but i want one MY size first!!!! btw nice to “meet” you. 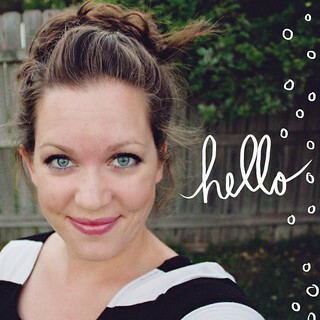 Your blog is TOTALLY adorable, this made me want to start my own family fast! I have never had a problem with it pilling. Now, I have never washed it though. I like it and I think as long as you take care of it the yarn will be wonderful for you. Oh, that is just so divinely cute! I LOVE this dress!! Turquoise & red is one of my favorite color combos. 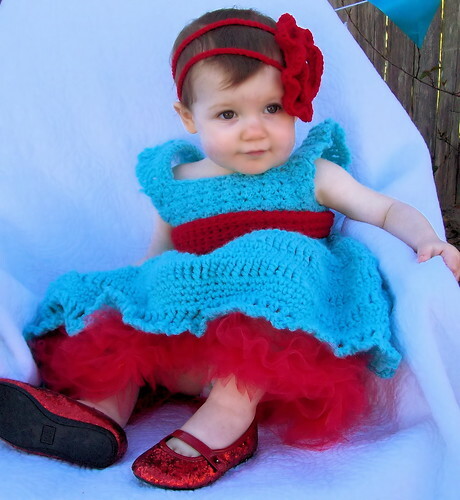 I’m new to crochet and can’t even imagine being able to “freehand” a pattern for a DRESS of all things! This is awesome! 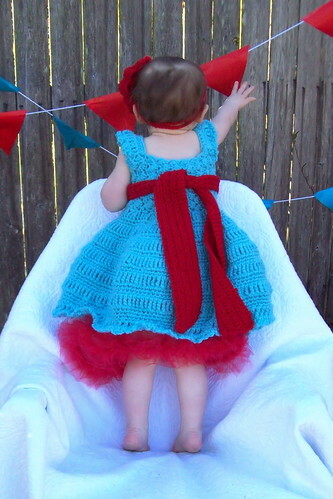 FANTASTİC……… ı fell in love..
You should create a pattern for this or a tutorial for this dress. It is so amazingly cute. Do you have a pattern for this dress? I love it!! !